For the song by the Housemartins, see There Is Always Something There to Remind Me. (1963) "(There's) Always Something There to Remind Me"
(1964) "Kentucky Bluebird (Message To Martha)"
"(There's) Always Something There to Remind Me" is a song written in the 1960s by songwriting team Burt Bacharach and Hal David. Originally recorded as a demo by Dionne Warwick in 1963, "(There's) Always Something There to Remind Me" first charted for Lou Johnson whose version reached No. 49 on the Billboard Hot 100 in the summer of 1964. "As Long As You're Happy Baby"
(1964) "(There's) Always Something There to Remind Me"
(1964) "I'd Be Far Better Off Without You"
British impresario Eve Taylor heard Johnson's version while on a US visit scouting for material for her recent discovery Sandie Shaw, who consequently covered the song for the UK market. Rush-released in September 1964, the song was premiered by Shaw with a performance on Ready Steady Go!, the pop music TV program. The first week after its release, the single sold 65,000 copies. Shaw's version reached No. 1 on the UK Singles Chart, spending three weeks at the top of that listing in November 1964, and that same month it debuted on the Billboard Hot 100. However, despite reaching the Top Ten in some markets including Detroit and Miami Shaw's version failed to best the US showing of the Lou Johnson original; the Hot 100 peak of Shaw's version was No. 52. A No. 1 hit in Canada and South Africa, Shaw's version of "...Always Something There to Remind Me" was also a hit in Australia (No. 16), Ireland (No. 7) and the Netherlands (No. 10), the track's success in the last territory not precluding hit status for the Dutch rendering by Edwin Rutten [nl] entitled "Ik moet altijd weer opnieuw aan je denken" (No. 12). Shaw herself recorded "...Always Something There to Remind Me" in French, as "Toujours un coin qui me rappelle", with lyrics by Ralph Bernet [fr], which reached No. 19 in France. A cover by Eddy Mitchell was more successful, reaching No. 2 in France in April 1965 and also reaching No. 3 on Belgium's French-language chart. Shaw made a bid for a German hit as well, rendering "...Always Something There to Remind Me" as "Einmal glücklich sein wie die ander'n". It was not a success. "Oh When I Was a Boy"
(1969) "Always Something There to Remind Me"
"(There's) Always Something There to Remind Me" – as "Always Something There to Remind Me" – entered the US Top 40 for the first time via a version by R. B. Greaves which reached No. 27 in February 1970. Recorded at Muscle Shoals Sound Studio in 1969, with production by Ahmet Ertegun and Jackson Howe, Greaves' version was also a No. 3 Easy Listening hit. (1983) "Voices In My Head"
Twenty years after its composition, "Always Something There to Remind Me" (so titled) reached the US Top 20 for the first time via a synthpop reinvention of the song by Naked Eyes which reached the Top Ten on the Billboard Hot 100 in the summer of 1983. 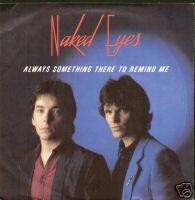 Vocalist Pete Byrne and keyboardist Rob Fisher first cut "Always Something There to Remind Me" as one of a number of demos recorded in Bristol upon forming the duo later known as Naked Eyes in early 1982. Byrne would recall: "I had always loved [the] song ["Always Something There to Remind Me"], so we called a friend who had the record, he read the lyric over the phone and we put it together from memory." On the strength of the demos cut in Bristol, Byrne and Fisher were signed to EMI Records in May 1982 and the track "Always Something There to Remind Me" was cut on 1 September 1982 in a session at Abbey Road Studios produced by Tony Mansfield. Byrne would recall: "The record was recorded at Abbey Road, and we were invited to a party downstairs, with Paul McCartney and many other stars...When we returned upstairs to the studio around 1 a.m., I decided to have a go at the vocal, It was the first time I have ever recorded a vocal in one take". Released in the US in January 1983, Naked Eyes' "Always Something There to Remind Me" gradually gained attention, entering the Billboard Hot 100 in March 1983 to peak at No. 8 that June. The cachet of entering the US Top Ten allowed the single, previously overlooked in its performers' United Kingdom homeland, to make a July 1983 UK chart debut, although it only rose to No. 59. "Always Something There to Remind Me" did afford Naked Eyes' Top 10 success in other countries besides the United States: Australia (No. 7), Canada (No. 9) and New Zealand (No. 2). In Brazil, the song was included on the international soundtrack of the soap opera "Guerra dos Sexos/War Of the Sexes" in 1983. Naked Eyes re-recorded the song as an acoustic version for the 2007 album Fumbling with the Covers. In the Philippines, the song was one of the most popular singles released in 1983. Naked Eyes' version appears in a 2017 commercial for T-Mobile, as well as the trailer for the fifth season for Arrested Development in 2018. 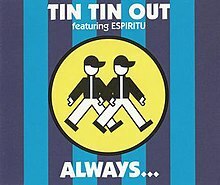 "Always (Something There to Remind Me)"
(1995) "Here's Where the Story Ends"
English electronic music duo comprising Darren Stokes and Lindsay Edward recorded a house cover of the song titled "Always (Something There to Remind Me)" in 1995. It features vocals by singer Espiritu and went to No. 14 on the UK Singles Chart and No. 1 on the UK Dance Singles Chart. Music & Media wrote about the song: "The first thing she reminds you of is all the previous versions of this Burt Bacharach & Hal David song. Spirited and dancey as it is, it doesn't make a poor figure at all." Dionne Warwick re-recorded "(There's) Always Something There to Remind Me" on 13 April 1967 in the same session which produced her Top 40 hit "The Windows of the World", and it was on the July 1967 album release The Windows of the World that the first-named track was debuted. Warwick's "(There's) Always Something There to Remind Me" had a belated single release in August 1968 as the intended B-side of the Top 40 hit "Who Is Gonna Love Me"; the first-named track received sufficient airplay to reach No. 65 on the Hot 100. Warwick's re-recording was later featured in the Black Mirror series 4 finale, "Black Museum". Other artists who have recorded this song include Viola Wills, Patti LaBelle and The Bluebelles, Julius Wechter and the Baja Marimba Band, Braid, Lou Christie, José Feliciano, Wayne Fontana, The Four Seasons, the Hippos, Jay and the Americans, La Lupe, Brenda Lee, Peggy Lee, Jim O'Rourke and Thurston Moore, Martha and the Vandellas, Johnny Mathis, Ted Neeley, The Troggs, Don Williams (when part of the Pozo-Seco Singers), Delroy Wilson, Mari Wilson  Blue Swede. Michael McDonald made his recording debut singing lead vocal on a 1968 single version by the Del-Rays. Sandie Shaw re-recorded the song in 1985 for the soundtrack of the movie Letter to Brezhnev. In 1965, Percy Faith and his orchestra released an album titled Percy Faith Plays Latin Themes for Young Lovers that included an "easy listening" instrumental version of this song. In 1966, Gianni Morandi released an album titled "Gianni 3" that included an Italian version of this song (Il mondo nei tuoi occhi), text by Sergio Bardotti and Giuseppe Cassia. In 1971, The Carpenters released their eponymous third album titled Carpenters that has a "Bacharach/David Medley" which includes "(There's) Always Something There to Remind Me". ^ "Artist Search for "lou johnson"". AllMusic. Retrieved 9 November 2018. ^ Billboard Magazine, October 1964. Retrieved 2018-06-28. ^ Tim Warden. "ARSA | Sandie Shaw (There's) Always Something There To Remind Me". Las-solanas.com. Archived from the original on 2011-07-13. Retrieved 2011-08-17. ^ Sandie Shaw's charting singles Retrieved December 7, 2011. ^ "Single Top 100 page for Always Something There To Remind Me". Retrieved 2013-09-11. ^ "flavour of new zealand - Lever hit parades". Flavourofnz.co.nz. Retrieved 9 November 2018. ^ Nielsen Business Media, Inc. (November 14, 1964). Billboard. Billboard Magazine. p. 34. ISSN 0006-2510. Retrieved November 9, 2013. ^ "Cash Box Top 100 12/26/64". Tropicalglen.com. Retrieved 9 November 2018. ^ "Artist Search for "rb greaves"". AllMusic. Retrieved 9 November 2018. ^ a b "Naked Eyes interview". Discog.info. Archived from the original on 21 July 2011. Retrieved 2011-08-17. ^ "Artist Search for "naked eyes"". AllMusic. Retrieved 9 November 2018. ^ a b Kent, David (1993). Australian Chart Book 1970–1992. St Ives, N.S.W: Australian Chart Book. ISBN 0-646-11917-6. ^ "Naked Eyes Chart History (Hot 100)". Billboard. Retrieved November 3, 2018. ^ "Cash Box Top 100 7/02/83". Tropicalglen.com. Retrieved 9 November 2018. ^ "Top 100 Singles of 1983 – Volume 39, No. 17, December 24 1983". RPM. Library and Archives Canada. Retrieved November 19, 2017. ^ "End of Year Charts 1983". Recorded Music NZ. Retrieved November 19, 2017. ^ "Top 100 Hits of 1983/Top 100 Songs of 1971". Musicoutfitters.com. Retrieved 9 November 2018. ^ "Cash Box YE Pop Singles - 1983". Tropicalglen.com. Retrieved 9 November 2018. ^ "New Releases: Singles" (PDF). Music & Media. October 22, 1994. Retrieved April 10, 2018. ^ "Eurochart Hot 100 Singles" (PDF). Music & Media. April 1, 1995. Retrieved April 9, 2018. ^ Dionne Warwick's charting singles Retrieved December 7, 2011. ^ Oller, Jacob (3 January 2018). "In the Superb "Black Museum," Black Mirror Looks at Its Own Reflection". pastemagazine.com (Paste). Retrieved 24 August 2018. ^ "José Feliciano - Feliciano!". Discogs. Retrieved 9 November 2018. ^ "Pop Deluxe - Mari Wilson | Songs, Reviews, Credits". AllMusic. Retrieved 2019-02-16. ^ "The Del-Rays". Staxrecords.free.fr. Archived from the original on 12 June 2011. Retrieved 2011-08-17. ^ "Letter to Brezhnev - Original Soundtrack - Songs, Reviews, Credits - AllMusic". AllMusic. Retrieved 9 November 2018. ^ "Percy Faith - Percy Faith Plays Latin Themes For Young Lovers". Discogs. Retrieved 2018-07-15. This page was last edited on 16 April 2019, at 22:51 (UTC).